Go ahead, make my St. Patrick’s Day! I know what you’re thinking, was it a 3 or 4 leaf shamrock? To tell you the truth in all this excitement, I kinda lost track myself. you’ve got to ask yourself one question. Well, do ya, dear readers? 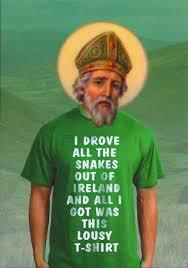 The 1st rule of St. Patrick’s Day, you do not talk about St. Patrick’s Day! This St. Patrick’s Day I’ll make you an offer you can’t refuse. I’ve always depended upon the kindness of Irish strangers, except no one’s a stranger on St. Patrick’s Day. Listen to them, children of the Irish, what beautiful music they make. If you pour the beer, they will come. I love the smell of shamrocks in the morning! I see Irish people. They’re everywhere. Some of them don’t even know they’re not Irish. Toto, I have a feeling we’re not in Ireland anymore. May the Green be with you. Nobody puts a wee Leprechaun baby in the corner. What we’ve got here is a failure to excommunicate! I feel the need, the need for Irish speed. 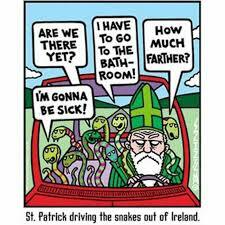 I’m still Irish, it’s the holiday that got less Irish! You do know how to whistle Toora Loora Loora, don’t you? You just put your lips together and blow. We’re goin’ need a bigger bar. Say hello to my little friend…they like to be called that now, the Leprechauns. Life is like a box of Baileys chocolates, you just never remember what you got. Hope you’ve enjoyed my St. Patrick’s Day-goes-to-the-movies edition. Remember, what happens on St. Patrick’s Day stays on St. Patrick’s Day. Previous Post It’s Friday the 13th, Do You Know Where Your Serial Killer is? Delightful and made me smile until I laughed. 😛 Early Happy Saint Pat’s. I met my Ex on St. Pat’s. I must have been green or seeing green. Ugh. Too funny! Isn’t there supposed to be gold at the end of the rainbow too? 🙂 Great post!! Well I’m all broken about that man’s kilts…. (Rights) Another Dirty Harry quote. He WAS good to look at and I was always for the bad boys. Too bad he didn’t have a brain, but I seemed to overlook that till it was too late 😀 😀 😀 Shoulda-woulda-coulda. Thanks DP. I’m worn out. Not as spry as I was once. And it’s still a riot! Thanks for pointing to this on Facebook. Hugs! Congrats, I’ve just nominated your blog for the Leibster Award. Please visit to see http://kimgosselinblog.com/. ok… where have you been all my life? Can I safely assume you’re Mr. Wrong?